It’s called the “post-holiday blues.” Even though it might not be a recognized syndrome, it’s a well-known fact that after the gifts have been unwrapped, toasts have been made and the holiday mementos are packed away, lots of folks get a little depressed after all the festivities are over. Well, here at Cribstone, we are eagerly starting the year with what we believe to be a very positive step forward in our ability to serve you. In our last letter, we announced that Taylor Haselgard has joined our Investment Team, and Ed Moran has joined Cribstone as its Chief Compliance Officer and Relationship Manager. We hinted that we would have more positive news to share, and I am now extremely pleased to announce that Amyn Moolji has joined Cribstone’s Investment Team, joining us from the U.S. Treasury where he has served for the last three years as Senior Advisor to the Under Secretary. Following his graduation from MIT and prior to Treasury, Amyn worked at Goldman Sachs and Taconic Capital, specializing in multi-strategy and event driven investing. Amyn has moved to Brunswick with his wife, Shenila Khoja-Moolji, who has joined the Bowdoin College faculty as Associate Professor. If you see Amyn and Shenila in Brunswick, please welcome them to our community. While we are not ‘feeling the blues’, the world stock market has just gone through a rough patch that certainly reflects the winter doldrums, ending 2018 on quite the downbeat note. In reality, the blues set in well before the candles were lit and trees were trimmed. From its peak on September 20th to the end of 2018, the S&P 500 Index dropped 14%. December was a particularly gloomy month—with the S&P 500 declining 9%, making it the worst December since the 1930’s. At one point in October, nearly two-thirds of all U.S. stocks in the S&P 500 were in what’s known as a “bear market,” or down at least 20% or more from their September highs, and mostly remained that way through the end of the year. These include most of the largest companies in the S&P 500 such as Facebook, Amazon, Apple, and big banks like Citigroup. This is in spite of the fact that there have been flickers of hope on the economic front, particularly with consumers: According to Mastercard SpendingPlus, which tracks both online and in-store retail spending with all forms of payment, shoppers delivered the strongest holiday sales increase for U.S. retailers in six years, shelling out $850 billion this past holiday season, up 5.1% from a year earlier. Furthermore, measures of people’s attitudes about the economy are still at historically high levels. However, the most respected measure of consumer confidence, compiled by The Conference Board, dropped for the second month in a row in December, touching the lowest level since summer. While that may be one of the few bright spots at the moment, it is an essential one since the consumer accounts for over two-thirds of economic activity. So, the question is whether this spending trend is sustainable. Two big categories have already begun to soften: housing and autos, which combined account for at least one-third of the average expenditures per consumer, according to the Bureau of Labor Statistics. Meanwhile the doldrums are affecting our friends overseas as well, where there are more plentiful signs of slowing: China, the world’s second largest economy, is a prime example: November retail sales grew at their slowest pace in 15 years and factory output sunk to its lowest point in three years. In the Eurozone, business growth declined to a four year low in the month of December. The IHS Markit Purchasing Managers Index measure of manufacturing output posted the weakest level since November of 2014. The yellow vests protests in France combined with uncertainty over Brexit are just some of the events that may be taking their toll on economic activity there. Unsurprisingly, the stock market performance of international markets surpassed the U.S. in their negativity, with the iShares MSCI All World ex-US Index falling 14.2% for 2018. Despite the slowing, we’re far from a recession. But all it takes is a deceleration in economic activity, as opposed to acceleration to spook the markets. Even the Federal Reserve has lowered its expectations, notching down the Central Bank’s December forecast for 2019 Gross Domestic Product growth to 2.3% from its September forecast of 2.5%. That is also a decrease from the 3.0% expected to be achieved for 2018. Obviously, this may impact corporate earnings, a key driver of stock price performance. Consider this: For the fourth quarter of 2018, the results of which are being reported as we write this, Wall Street analysts are now expecting year over year earnings growth of 13.4% for the companies that constitute the S&P 500 Index, according to FactSet. That’s a deceleration not only from the 25%+ that occurred in the third quarter of 2018, but is also a downward adjustment from the 16.7% rate of growth that had been expected three months prior. This is what the stock market has been adjusting to. As we noted in our October 2018 email that we sent out in the early stages of this correction, the Federal Reserve is trying to manage the delicate balance of maintaining growth and controlling inflation by primarily using a tool called the Federal Funds rate. Basically, the Fed has reversed policy from one where they literally turned on the liquidity spigot to promote economic growth to essentially turning it off to control inflation. In the midst of the 2008 financial crisis, the Fed slashed this rate from over 5% all the way down to 0%. It stayed at that level until December 16, 2015 when it raised it for the first time since 2006 to 0.25%. 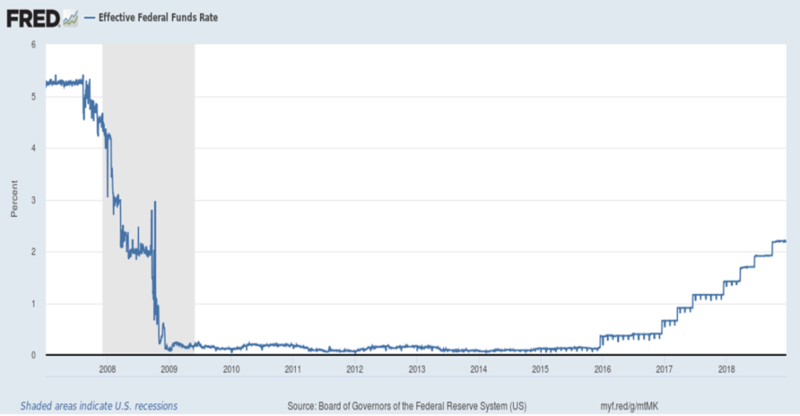 As you can see from the graph below, the Fed Funds rate has been on a fairly steady climb since then. In mid-December, the Board raised the rate 0.25% for the fourth time in 2018 to 2.25-2.50%. In addition to manipulating the Fed Funds rate, the Fed also provided liquidity to the financial markets during the Great Recession by pursuing a policy called, “quantitative easing.” This fairly unconventional approach meant that the central bank purchased government and other securities from the market in order to inject more funds into the financial system. These policies not only helped pull the economy out of the slump but also helped pump up prices of financial assets. 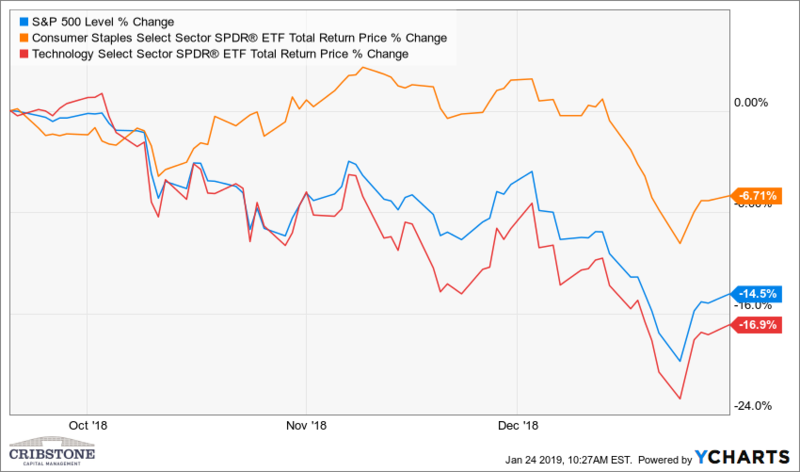 Suspecting that this policy reversal might negatively impact the financial markets—at least in the near term, we have, generally speaking, been taking a slightly more defensive and quality tilt to the equity side of our clients’ portfolios. This has served us well since volatility ramped up in October of last year. Yes, we are seeing declines across the board, but our positioning in equities as mentioned above, has been able to provide some degree of downside protection relative to not only the market overall, but particularly to the growthier (technology oriented) segments of the market. This may be best displayed in the chart below. From the market’s September 20th 2018 high until the end of the year, the S&P 500 overall fell 14.5%, the growth-oriented Technology Sector alone dropped 16.9%, while the more defensive Consumer Staples sector declined only 6.71%. on a total return basis. As we’ve stated here before, we have been maintaining a relatively short duration—or maturity-date target on the bond portion of clients’ portfolios. This has helped insulate those investments from the big run up in interest rates we witnessed throughout the year until mid-October. More recently, however, in spite of what the Federal Reserve is doing with short term rates, longer term interest rates have retreated. The 10-year Treasury yield, for instance, dropped to as low as 2.56% on January 3rd, down from a high of 3.2% in October. This is another indication that expectations for future growth are ratcheting down. It goes without saying that we are constantly monitoring our holdings, their performance and the outlook going forward. It’s quite likely that as the markets adjust to shifting expectations for the economy, corporate profits, and interest rates, that there will be more volatility ahead. As always, we make decisions with a focus on risk management, as well as on taking advantage of attractive opportunities as they arise. As we commence a new year, we will be reaching out to all of you to get together to review your investments as well as your financial plan to ensure we are on track with your goals and are invested in a way that is consistent with your risk tolerance and objectives. But please don’t hesitate to reach out to us in the meantime with any questions you have.